THIS EXPEDITION IS NOT CURRENTLY SCHEDULED. This expedition will be based in northern Chile. 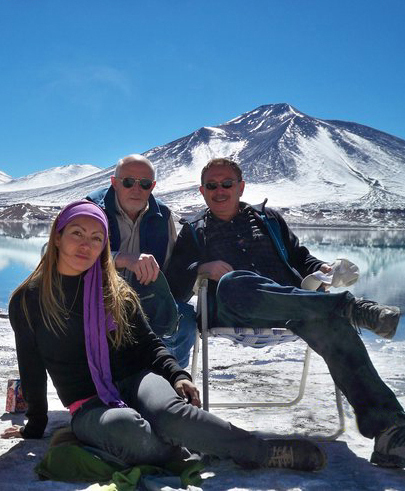 This is an area of the Andes we know well, having run many successful trips in the past twenty five years, including five previous trips to the 6000m peaks around the Laguna Verde that feature on this itinerary. The expedition will fly out to the provincial city of Copiapo via Santiago, the capital city of Chile. After an initial acclimatisation phase of three days camping and walking at about 3500-4500m in the area known as Vallecitos we will move to the very scenic Laguna Verde base camp. We'll do some further acclimatisation climbs here including the ascent of at least one 5000m+ peak. There are small hot springs right by the campsite at Laguna Verde, and some very beautiful views. The title picture at the top of the page was taken at this campsite at sunrise. Once better acclimatised we'll climb some of the larger peaks in the area with the aim being to summit at least two 6000m+ peaks. 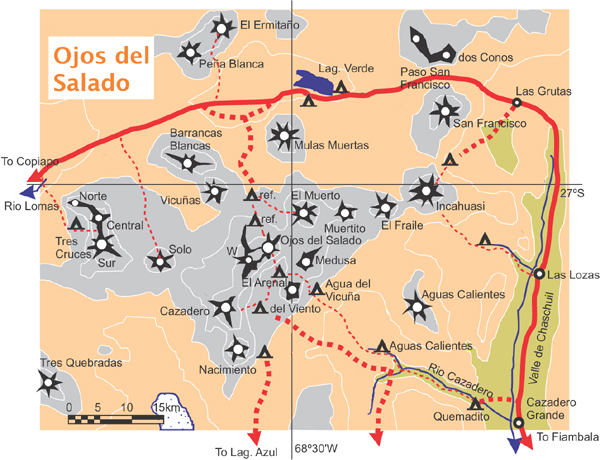 Likely summits we may try include Barrancas Blancas 6119m and Peña Blanca 6030m. These peaks are just day trips from our base at the Laguna Verde, using a 4x4 for approaches, so very little backpacking is required on this trip. This main mountain trip will be a 7 night expedition away from civilization. All of the peaks on this itinerary have no technical climbing on them and are just "walks". But these "walks" can be over very rough and unstable ground, and it is all at extreme altitude. We do not expect to need an ice-axe and crampons for the peaks on the main itinerary. The ascents on this expedition are suitable for strong hillwalkers, although previous expedition experience is preferred due to the demanding weather and camping conditions. Please call or email if you have any questions about the suitability of this trip for you. Day 7-10 Ascents near the Laguna Verde. The plateau of the Puna de Atacama lies on the border between Chile and Argentina and includes a huge area over 4000m above sea level. There are still unclimbed peaks of over 5000m in this remote area. Some of the peaks in the area were climbed at the time of the Inca empire, when the mountains were worshipped as gods by the inhabitants and were ascended in order to make sacrifices. The Puna is one of the most beautiful and haunting places in the Andes, compared by many to the high plateau of Tibet. The scenery is a bit desolate for some, but the huge open spaces, clear air and big blue skies leave a deep impression on everyone who visits this area. Copiapo is a small provincial capital in the Atacama desert at the foot of the Andes, about 500m above sea level. It is the nearest access city with an airport for the Chilean side of the Puna de Atacama. Copiapo is a major mining centre in northern Chile, so we'll apologise in advance for there not being a great deal of touristic stuff to see around town but at least you'll get a good steak and a hot shower! The hotel we normally use also has nice relaxing grounds and a swimming pool. Summit day on El Muerto, January 2017 ANDES expedition. Despite the fact that at first sight the high plateau of the Puna de Atacama is very barren, the area is really quite good for seeing some of South Americas unusual wildlife, particularly on the 4x4 drives into and out of the mountains. Vicuña and guanaco are wild relatives of the llama and are seen frequently in the foothills. On the lagoons there are flamingos and other species of birds and on this trip we can pretty much guarantee to see a condor circling the peaks. Flamingoes in the Atacama near our acclimatisation base. Although there is no difficult climbing involved in the ascents planned on this expedition, climbing to such heights is still a serious matter because of the lack of oxygen at high altitude. 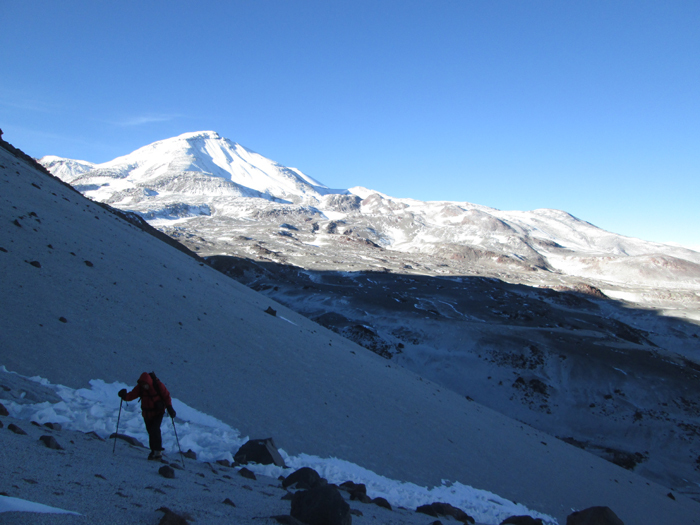 We will allow time for expedition members to acclimatise to the altitude but because of the nature of the expedition we recommend clients to have previous successful experience at altitudes of about 4500m-5000m. For this expedition good mountain fitness and stamina are important, but for high altitude expeditions clients also need good cardiopulmonary (heart and lung) fitness. This can only be maintained, by a program of intensive exercise such as sprinting (not jogging), squash or sprint cycling. This should be done in small doses (e.g. half an hour every other day) over a period of at least two months. The climate at altitude in the Puna de Atacama is very cold and extremely dry. In the mountains temperatures can fall to -20ºC at night. During the day in the mountains it can feel very warm in the strong sun, but it can also be bitterly cold and windy. It should be dry all the time we are in South America, although there is a chance of a snow flurry, or occasional afternoon thunderstorm in the mountains. As we are near the tropics come prepared for about 10 hours of darkness every night. Temperatures in the valleys around Copiapo and in other low lying areas will be a very pleasant 20-25ºC during the day. Relaxing by the Laguna Verde on the Chilean side of Ojos del Salado. Our expeditions are designed to be small and flexible. The expedition will be co-ordinated, organised and lead by us, but we will consult and involve the expedition members when planning the day-to-day details of the trip. Please note however that the leaders decision is final where the safety of the group or any member is in jeopardy; for example where retreat or diversion is necessary due to illness or bad weather. The minimum number of customers we need to run this expedition is three. The maximum size of the expedition will be four customers plus leader. 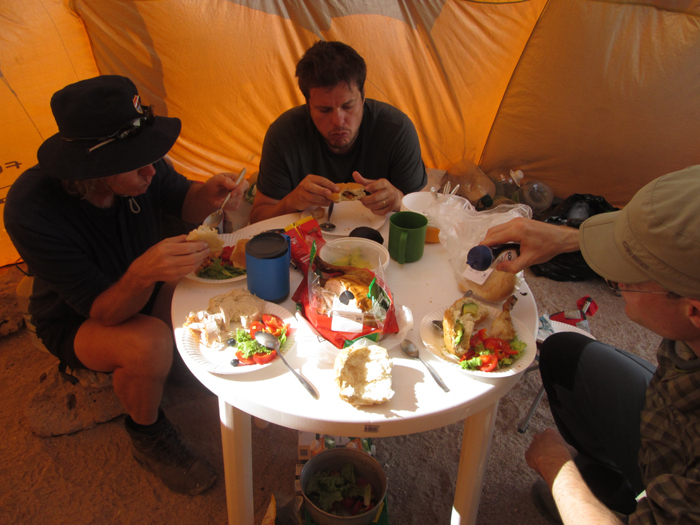 Dinner at 4300m, Laguna Verde. ANDES expedition, January 2017. Extreme remoteness : You will be camping in a remote area for an extended period and therefore obtaining medical assistance for any problem will be a slow process. There is no chance of a helicopter rescue. Weather : The Puna de Atacama is occasionally affected by severe and sometimes dangerous storms, including thunderstorms. There are frequent high winds. Forecasts are not so reliable. Mountain Hazards : In certain places you may be subjected to a slight risk of rock fall.